It’s time to gather paperwork and prepare your returns by April 18th. Since it’s likely been a year since you last spoke to your CPA, it’s important to outline any changes in your personal situation and familiarize yourself with changes in the tax code. Here are nine important questions to discuss with your CPA this tax season. You probably know the tax-time drill by now: As you prepare to meet with your tax accountant, you gather W-2 and 1099 forms, receipts, banks statements, and mortgage documents. But that’s just the beginning. The real issue is what has changed in your life the past year? The paperwork tells your ﬁnancial story, but there may be a lot more going on with your life than can be seen in your documents. 1. What kind of difference does a family change make? Or how about a major purchase? Be sure to tell your CPA about any births, adoptions, marriages, separations, divorces, or deaths. Have your children reached a milestone age like 18 or 21? Have they left school and started jobs, possibly changing their deductibility status? Death in the family is especially important: Does an inheritance trigger a federal or state estate tax? If an inheritance includes an IRA or 401(k), the tax rules are strict and, failure to properly manage the inheritance could have major tax consequences. Major purchases can also have a big effect. A second house may mean another set of home-related deductions. But probably not a third house, as the homeowners can typically only get deductions from two residences. 2.What will my tax bracket be in 2016? Your tax bracket is the rate at which the last dollar of income will be taxed. Knowing your tax bracket helps you and your advisor calculate the tax efficiency of various investment or financial planning proposals. A paycheck change is only one factor, so don’t make immediate assumptions: tax brackets can change for many reasons, including changes in tax law as well as changes in your tax filing status. Tax filing status depends on whether you are married or single and whether you have dependents to claim on your tax return or not. A change in income or an increase in interest and dividends or even gambling or lottery winnings could also change your tax bracket. 3.Can you help me estimate my income for 2016? Go beyond salary. Bonuses, freelance assignments, investment income, alimony winnings, and more all play a role. And it’s not enough to know gross income. It’s also important to have an estimate of adjusted gross income, modifications to adjusted gross income, and taxable income. Each of these types of income is dependent on various deductions or credits that need to be estimated in order to come up with projections for the new year. Why is this even important? An accurate estimate of 2016 income allows you to properly manage retirement savings plans, for example. And it helps to make sure your financial advisor and your CPAs are communicating with each other and working from the same page. In order to estimate the various forms of income for 2016, you’ll need to provide your tax advisor with certain information so the numbers can be crunched. For example, your CPA will need to know if you plan on making approximately the same amount of charitable contributions this year as you did last year. And if there was a one-time or unusual event last year, such as a sale of an asset, the CPA will need to adjust the estimate accordingly. 4. Do I have any remaining loss carryforwards going into 2016? Your CPA can help you determine your loss carryforwards by looking at your past tax returns. The answer can help you better understand how investment activity affects your tax situation. Occasionally, your financial advisor may suggest that you sell some assets to absorb some of these previous losses for precisely this reason. “Tax loss harvesting” is traditionally a year-end activity, but it really should take place throughout the year as investment opportunities present themselves. 5. Am I eligible for a Roth conversion—and is it recommended? any distributions you do take. A Roth conversion also involves paying taxes on the assets you convert, since contributions to traditional IRAs are made on a tax-deferred basis. A CPA can estimate the tax that would be due on a Roth IRA conversion. Also ask your CPA for an estimate as to what the tax liability would be on a partial Roth conversion—such as one that would brings you up to the top of your current tax bracket. The CPA’s estimate of the “bracketcompletion” amount is likely to be the most accurate estimate of the tax you’d pay in the event of this type of partial conversion. Your CPA is likely to have an opinion on whether a Roth conversion is a good idea or not. Definitely discuss the option with your CPA as well as your financial advisor before making a decision as any conversion will have investment and retirement implications, as well as tax consequences. 6.Should I increase my retirement plan contributions? 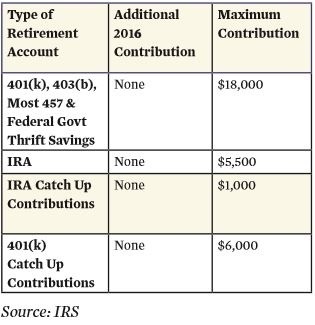 The IRS has increased the contribution amounts for 401(k) and other employer sponsored plans in 2016, so there’s some opportunity for increasing contributions. Phase-out limits for various plans have also increased, so if your income is up, you may be able to put away more. This is a good conversation to have with all of your advisors this time of year. 7. Do you have any recommendations for reducing my 2016 taxes? What about 2017 and beyond? CPAs can recommend a number of strategies that might help reduce tax liability in the future. A variety of laws, such as ACA, have changed the playing field. Some of the strategies may be complex and may need the input of your financial advisor. Others may be within your control. For example, if you are a small business owner, you may have the ability to accelerate expenses into a new year. Trusts and estates may be able to take advantage of “do over” provisions if they act early in the year. 8.Should I change my tax withholding for 2016? Various situations may mean that you need to change your withholding on your Form W-4 with your employer. If you’ve gotten married, divorced, or had a baby, you’ll need to make changes on your W-4. Also, if you’ve been getting large tax refunds, it may make sense to increase the number of exemptions you take on the W-4 to match up what you pay in tax with your actual tax obligation. Most CPAs note that it’s better to evenly match withholding with tax obligations rather than aim for a large refund. That’s because the funds that make up the refund could be available to you through your paycheck and invested, saved, or used to pay down debt rather than accumulating in the U.S. Treasury Department only to be returned back to you in the form of a refund. And don’t necessarily consider a state and federal lock-step. There may be reasons for separate withholding forms for state and federal—ask your CPA if that is relevant to you. pass the answer along to your financial advisor. The better informed your advisors are about your tax situation, the more effective they can be in planning and managing your investment and financial affairs. Don’t assume that tax efficiency is the only goal. If you’re retired and in a low bracket, for example, it may not be worth it to accept a low return to take advantage of tax-advantaged investment like municipals. This is the perfect opportunity for three-way communications between you, your financial advisor, and your CPA. Richard J. Koreto has been a journalist covering tax and finance for 20 years. He is the author of “Run It Like a Business: Top Financial Planners Weigh In on Practice Management” and is a past president of the New York Financial Writers’ Association.